The new school canteen, the mensa, will be refurbished with an acoustic ceiling to maximize sound quality. White binders divide the ceiling into eight fields each subdivided into twenty square partial surfaces. Starting from the green food serving station, the ceiling rises obliquely towards the horizontally structured surface of the windows. Illumination to the mensa is provided by large disc-shaped pendant lighting fixtures distributed across the ceiling. Red-brown cladding sheets cover the exterior façade. 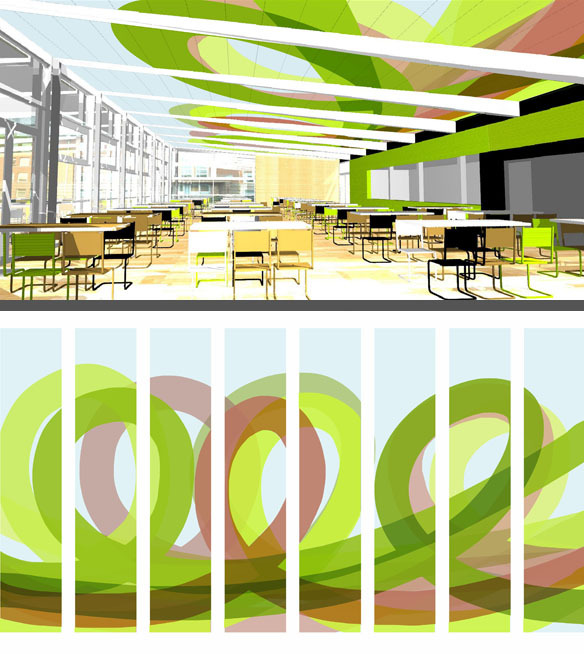 The acoustic ceiling will be covered with an artistic print design for which a digital draft has been developed which will include references to the architectonic color concept expanding the room in accordance with the school’s location. Into the mensa—a quick break, meeting, eating, pausing—and out again. A mensa is a space of congregation, communication, connection, class breaks. The students enter, eat, and leave together. My idea gives form to this movement. Sumptuous, calm loops trace the file of students during lunch break on the acoustic ceiling: the incoming, almost straight line describes the movement into the room towards the serving station. The line’s continuing circling movement represents sitting down, eating, and pausing, while the outgoing line leads out of the room. By means of free repetition in graduated colors a calm ceiling painting emerges. The movements are drawn across the entire surface of the acoustic ceiling filling its space completely. The intense color overlap on the lower end of the ceiling along the counter of the serving station reflects the space in which the highest densification of the room takes place. The basic colors are matched with the green counter, the red-brown cladding sheets of the façade and are complemented by a connecting, friendly yellow-green. Each of these colors is repeated several times, their color intensity is gradated. This and the overlaps create color differentiation and enhance spatial depth. The loops created by the sweeping movement point towards the surface of the windows where a continuous free surface is maintained. The ceiling’s basic surface is painted sky-blue so that the entire ceiling surface is perceived as one continuous expanse that references the view of the sky while the curvilineal forms of the loops pick up the circular forms of the large pendant light fixtures. The reduced line management represents the theme of movement and simultaneously generates an intended calming effect through its lush, warm color scheme, while simulating on the ceiling, the passage of the students through the mensa.